Have you given any thought to your retirement? 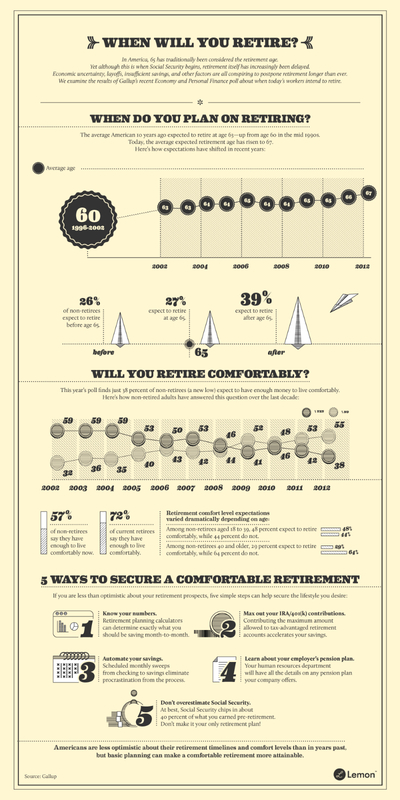 Lemon.com has supplied an infographic with information from Gallup that lays it all out when it comes to retirement ages and comfort levels, and how you can make sure you get the best retirement possible. In the 1990’s Americans were expected to retire at age 60. That number rose in the 2000’s to 63 and is now climbing even higher, with the average age for retirement currently being 67. In 2002 the average age was 63, which rose in 2004 to 64, and then rose again in 2006 to 65. The average retirement age rose again in 2011 to 66, and then again in 2012 to 67. Only 26% of current workers expect they will be able to retire before they reach the age of 65. Another 27% expect they can retire at the age of 65. The majority of current workers, 39% expect that they will not be able to retire before the age of 65. In an even more bleak outlook at retirement, the majority of workers, 55% of them, actually do not expect that they will have enough financial security to afford a comfortable living in retirement. This number is down from 2002, when 59% of people thought they would be able to afford a comfortable living. Unfortunately, the older that workers get, the lower the expectation for retirement comfort tends to get. In the 18 to 39 age bracket, 48% expect they can retire comfortably, while in the 40 and older age bracket, only 29% expect to retire comfortably. Luckily, there are steps you can take to have financial security and the comfortable retirement you deserve. The first step is to understand your situation. There are calculators available to help you plan your retirement and determine exactly what your monthly savings should look like so that you’ll have enough tucked away by the time you retire. Luckily, the younger you are the less you’ll need to save each month. Taking advantage of the tax advantages offered by IRA and 401K contributions is the second step to securing a healthy retirement savings for yourself. One great way to keep yourself saving is to automate the process. You can use online banking to schedule money transfers from your checking to your savings. Even if it’s a small amount, it can really add up over time. Learning about the pension plan offered by your employer is the next step to securing your retirement funds. And of course, do not expect social security to make up the difference of what you need vs. what you’ve saved. Unfortunately, most people find that it is really not enough to cover basic living expenses.